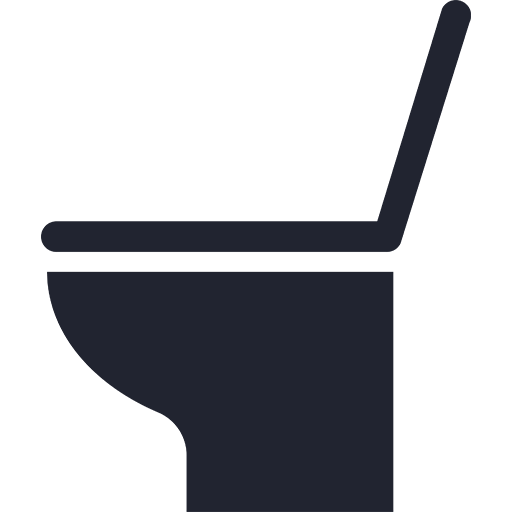 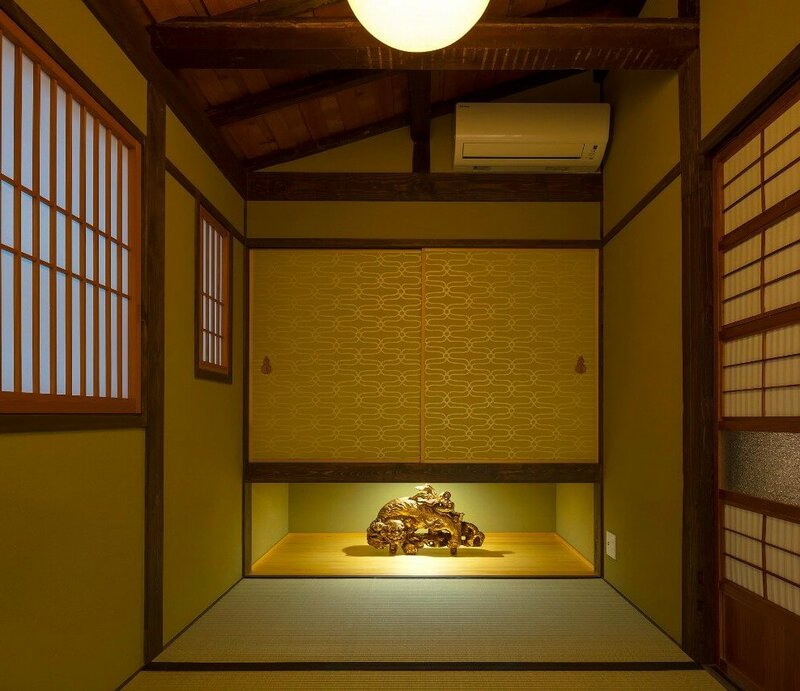 Japanese culture is one that is largely influenced by ancient and auspicious motifs that can be found in design, artwork, commodities, and more. 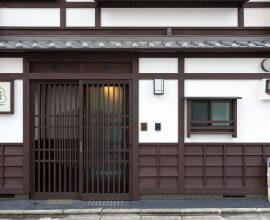 Yoshimigura machiya house incorporates these ideas, designs, and motifs of good luck to showcase another prominent side of Japan. 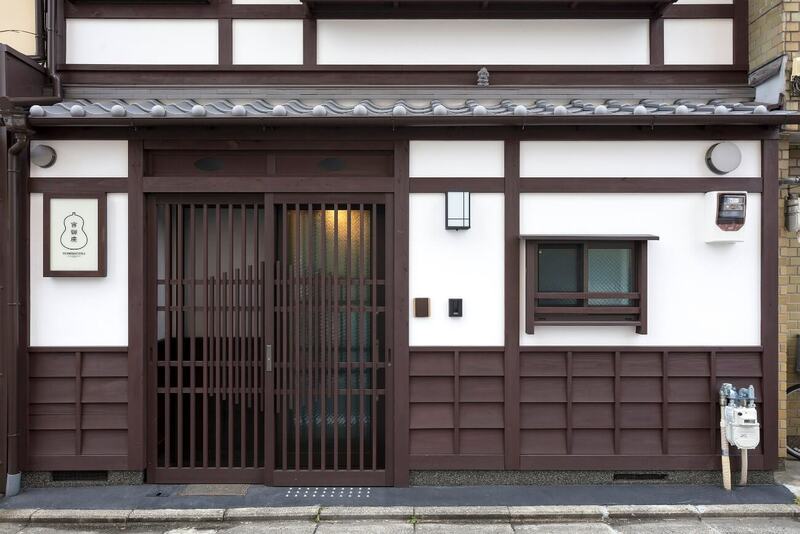 This is an elegant machiya house with all of the charm of a traditional Japanese house. 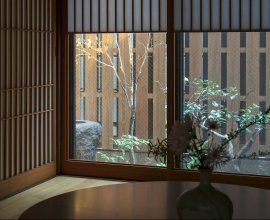 Images and motifs of the matsu tree, bamboo, and plum blossom can be found throughout the house — representing longevity, flexibility, and purity, respectively. 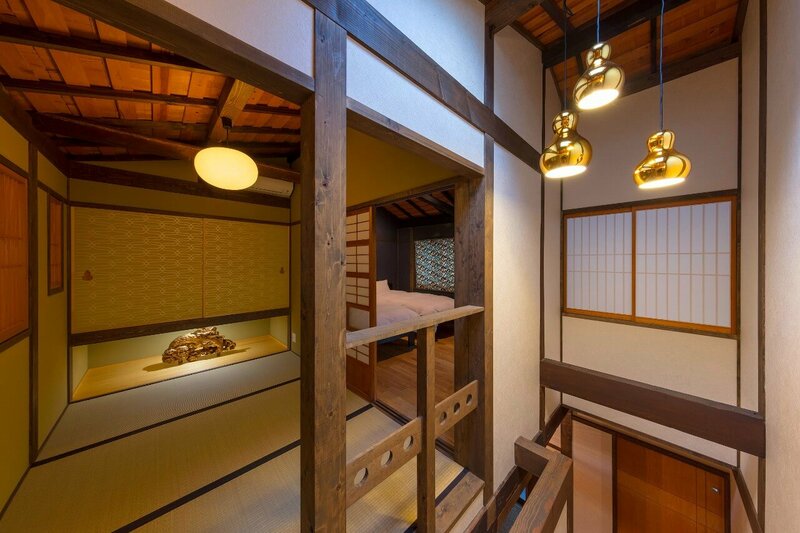 From the curtains in the 2nd floor bedroom, to the intricate artwork displayed on the walls. 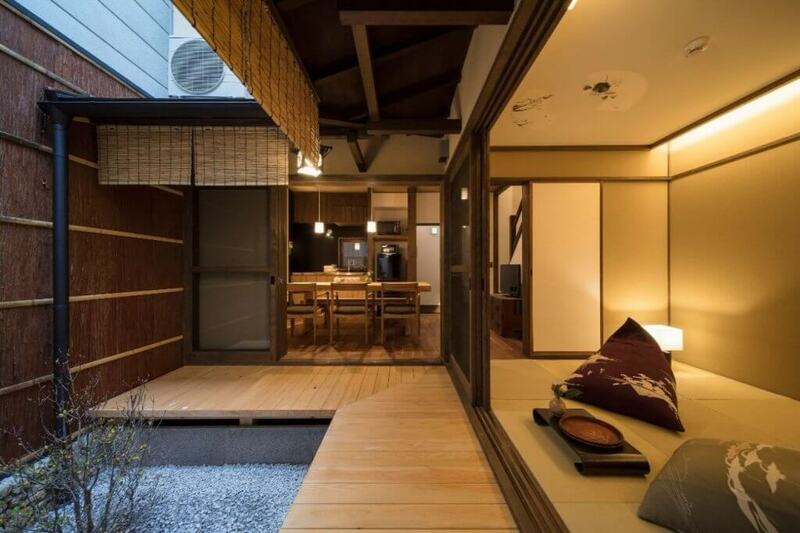 A small, yet intimate house is deceptively more spacious that what its exterior suggests. 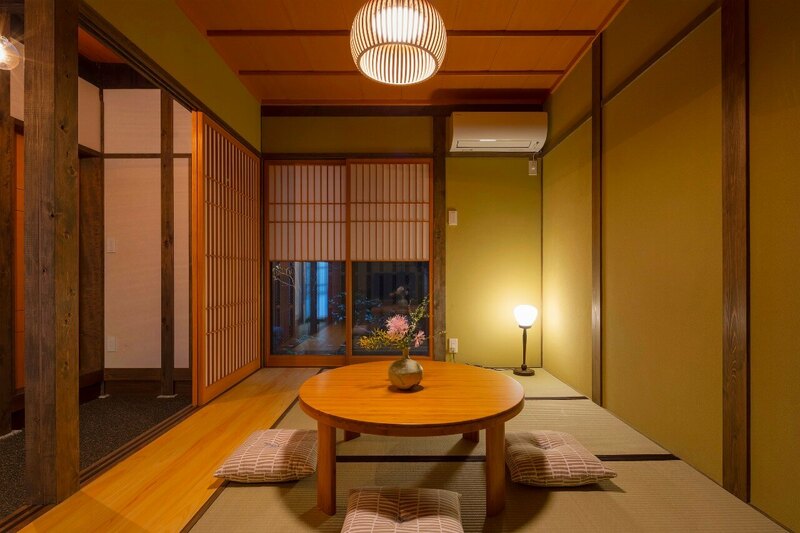 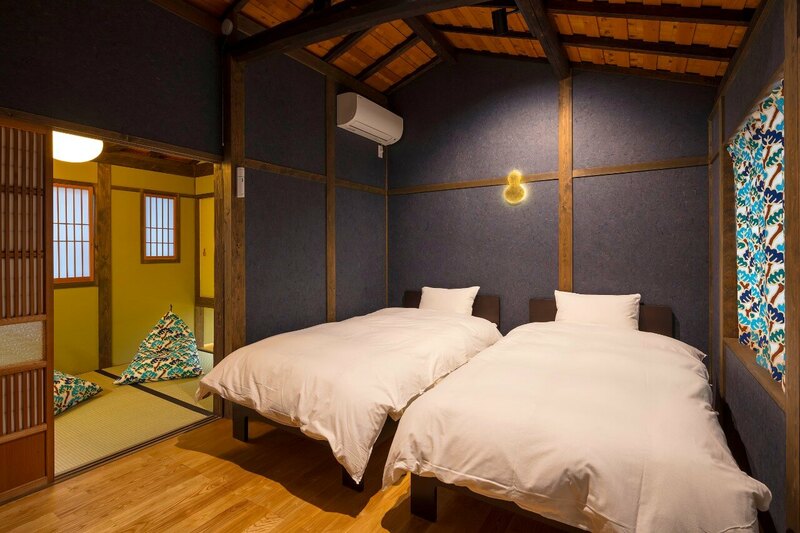 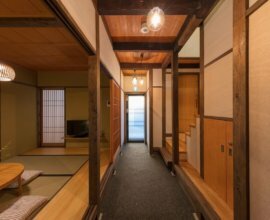 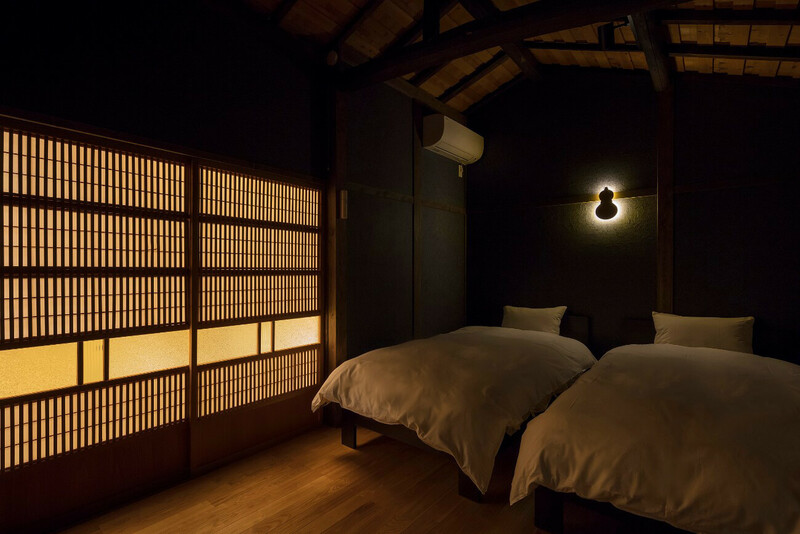 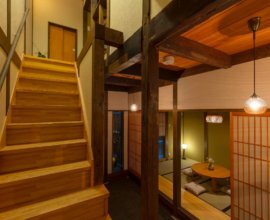 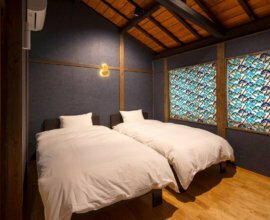 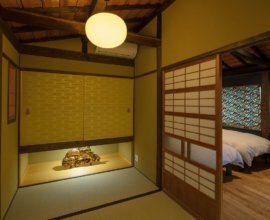 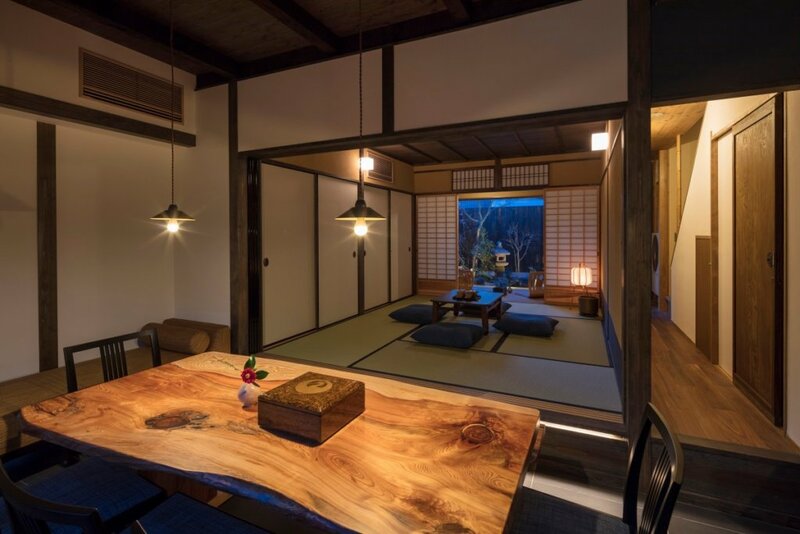 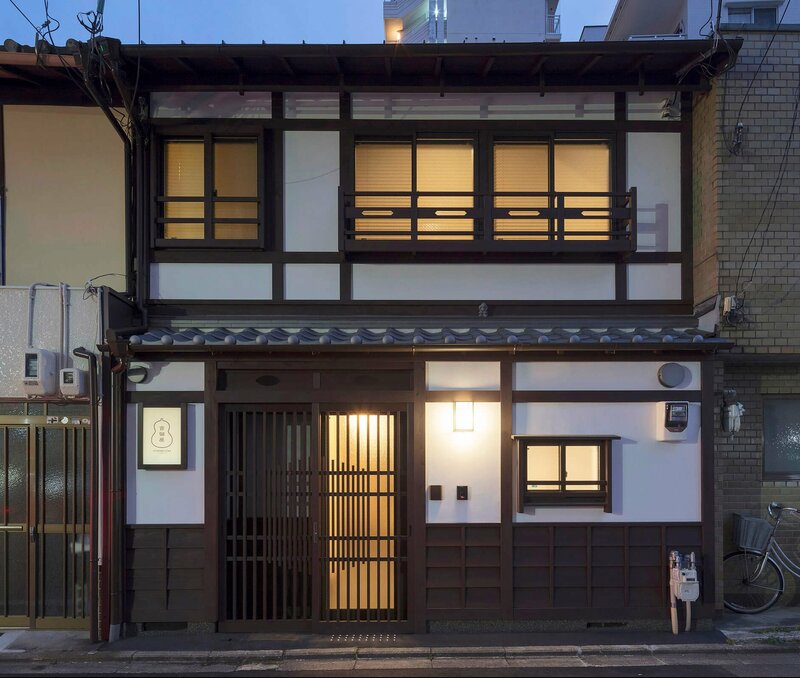 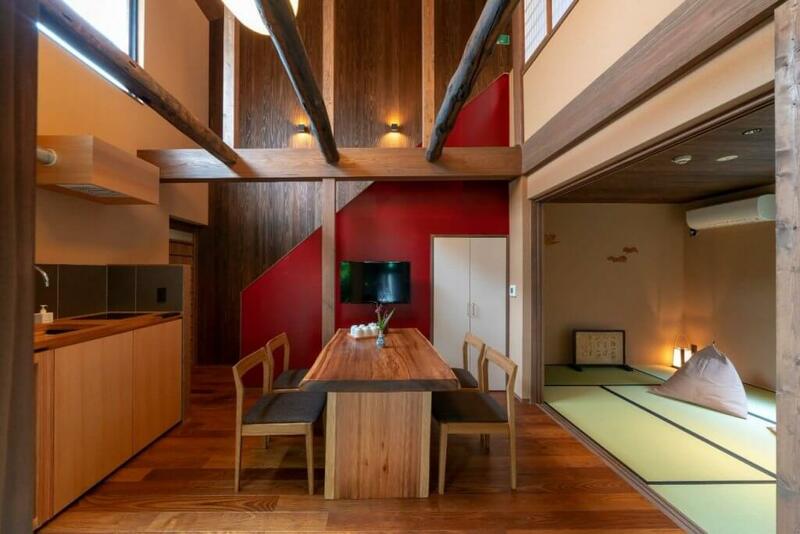 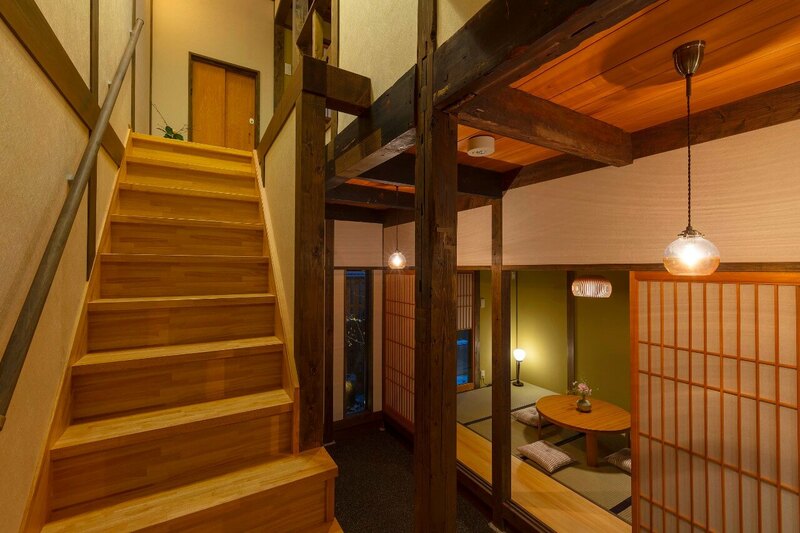 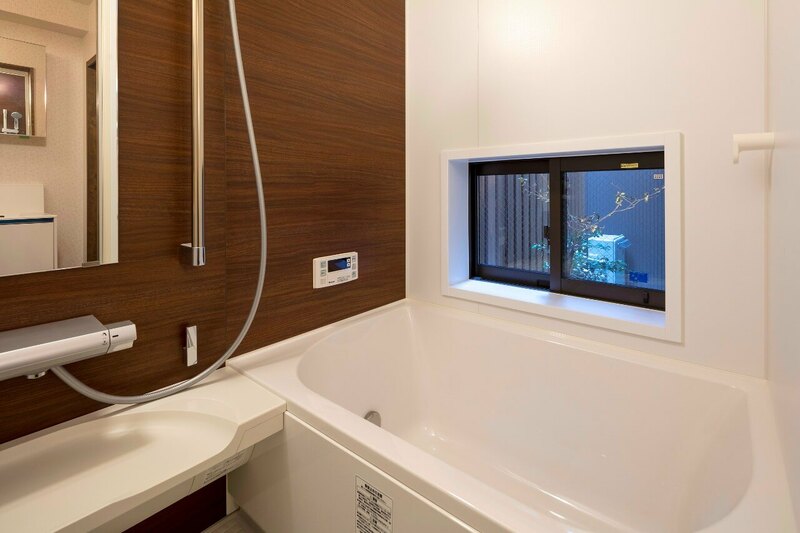 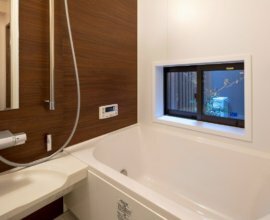 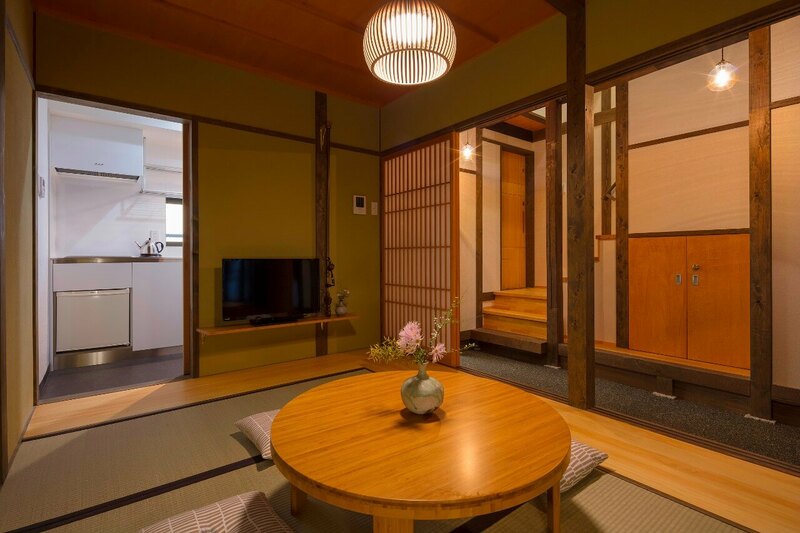 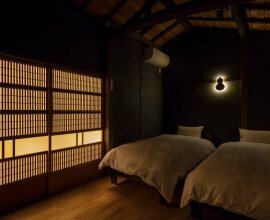 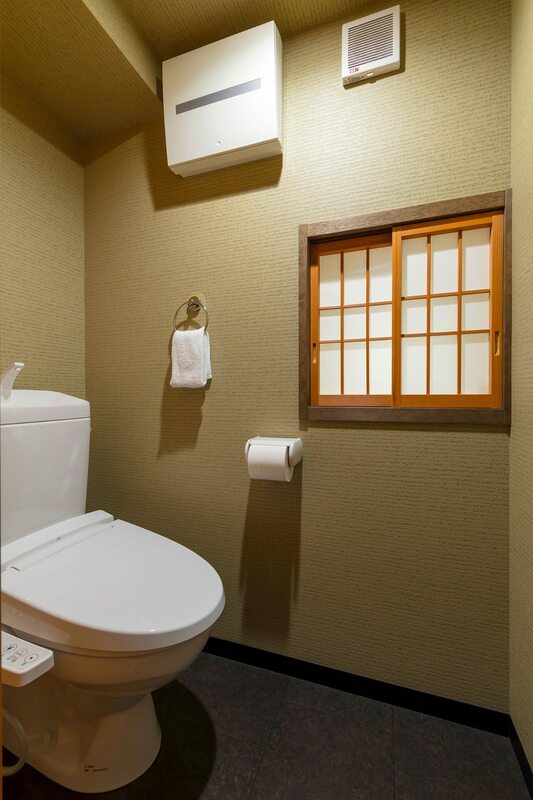 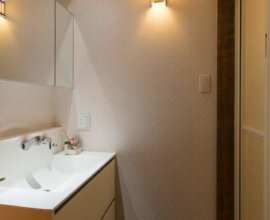 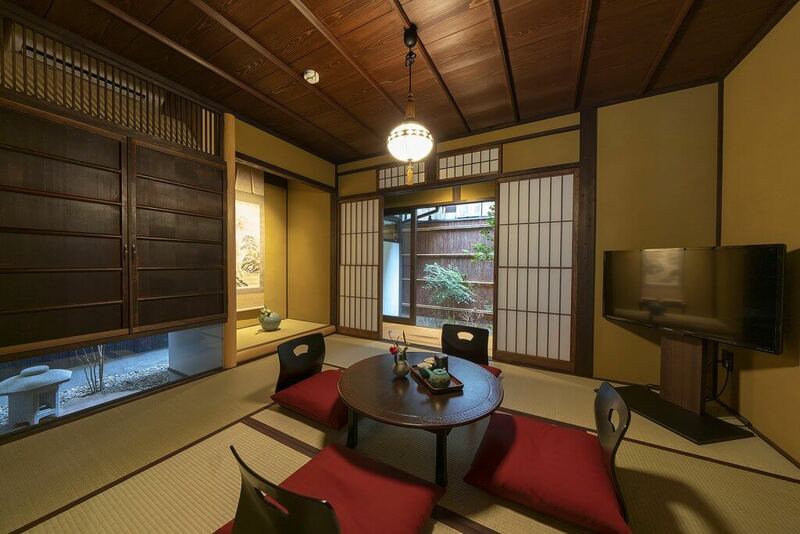 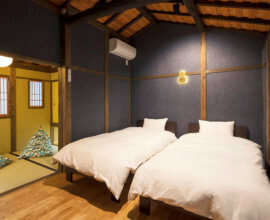 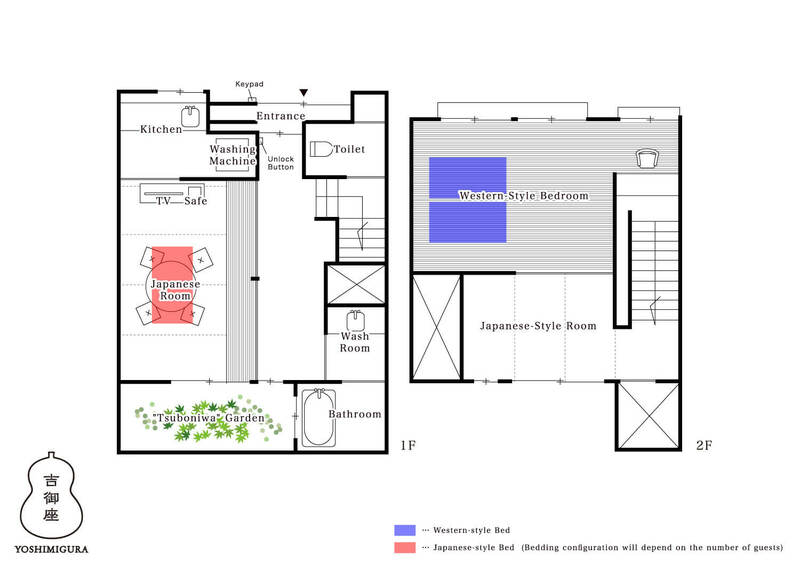 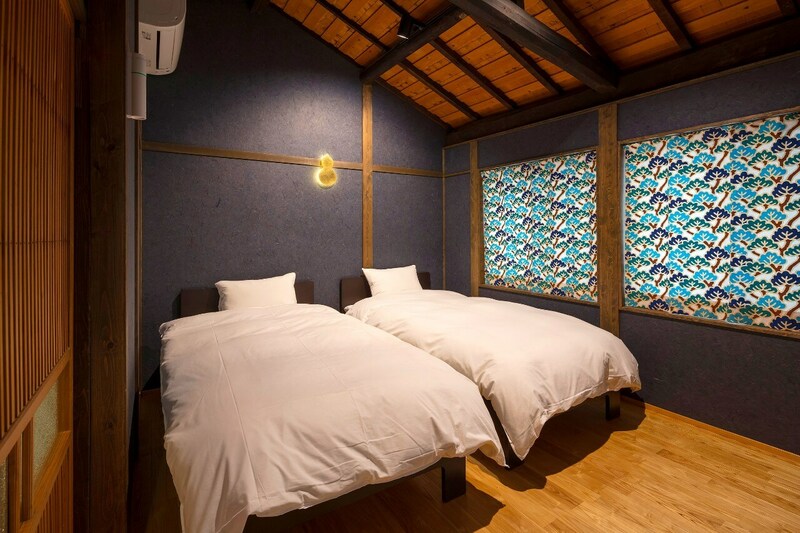 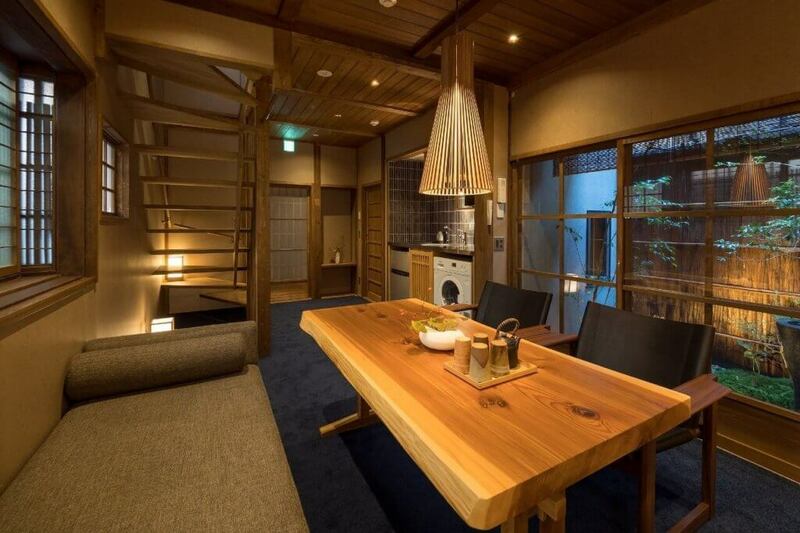 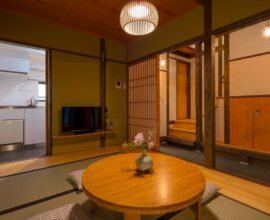 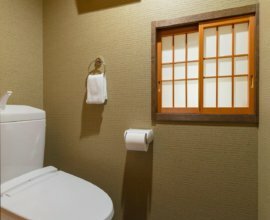 A perfect house for smaller groups of family, friends, and couples — this house is the ideal place to begin your exploration of the historical city of Kyoto. 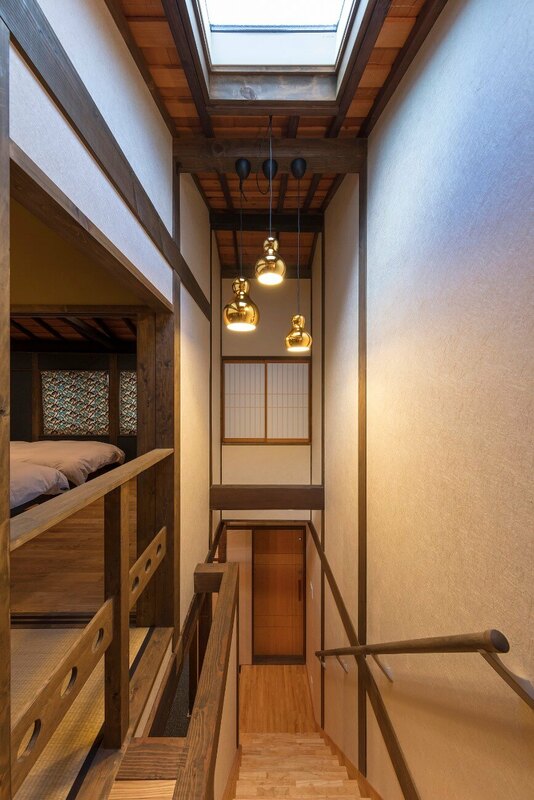 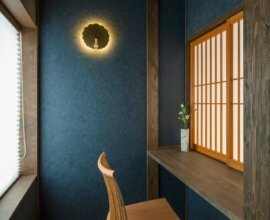 Good fortune gathers here From the blue matsu tree fabrics in the living room to the gourd light fixtures above the staircase, uncover the charm of Japanese history and tradition within each room. 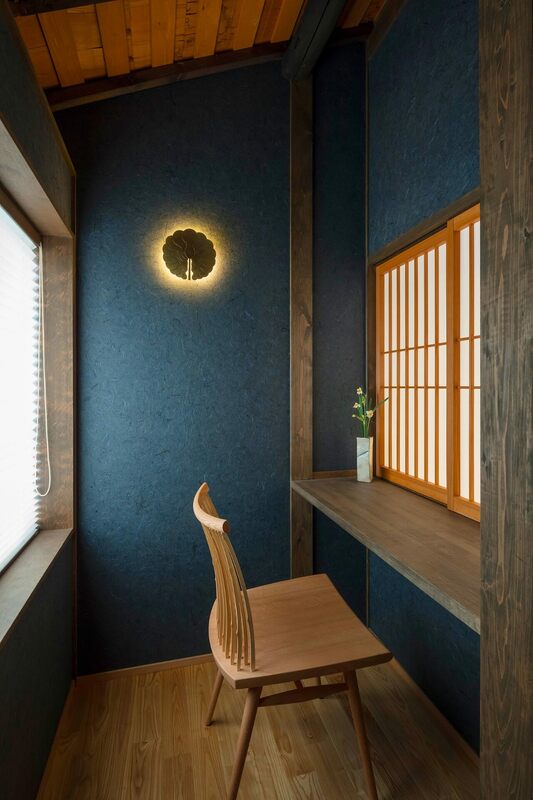 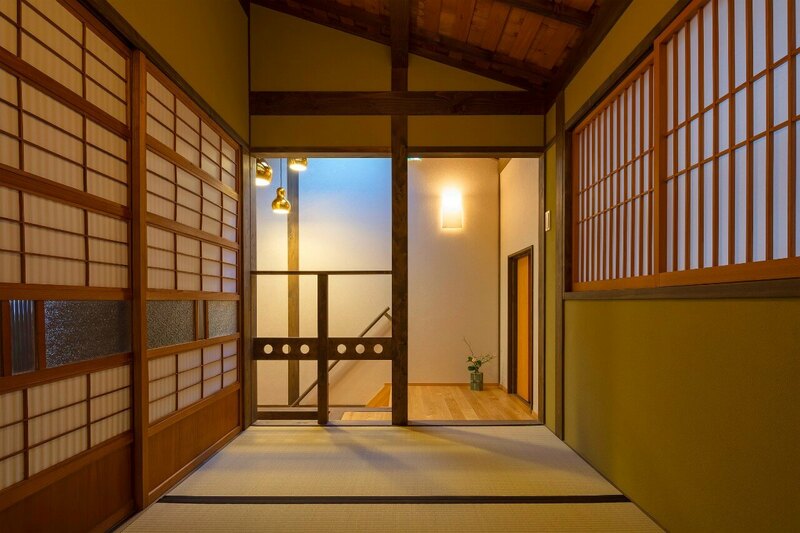 'Shoji' paper doors Step through front door and allow the shoji doors to draw your eyes into the house. 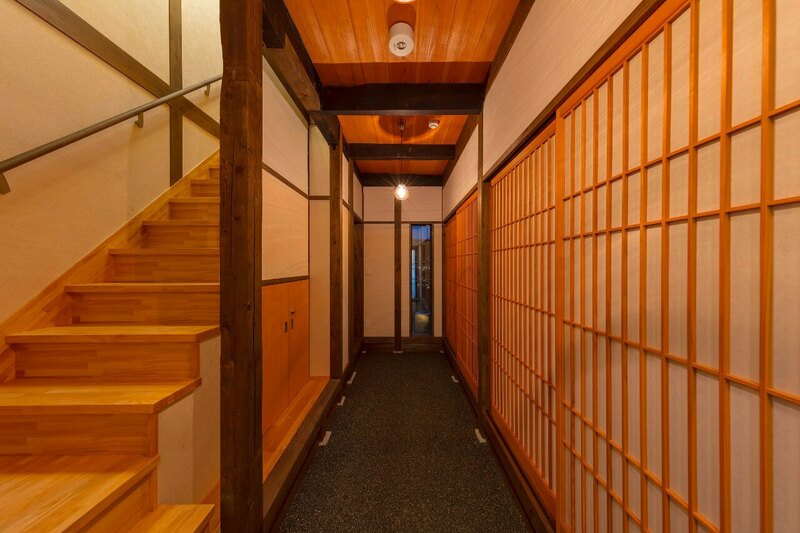 The doors blend seamlessly into the other woodwork of the house and add warmth to the space. 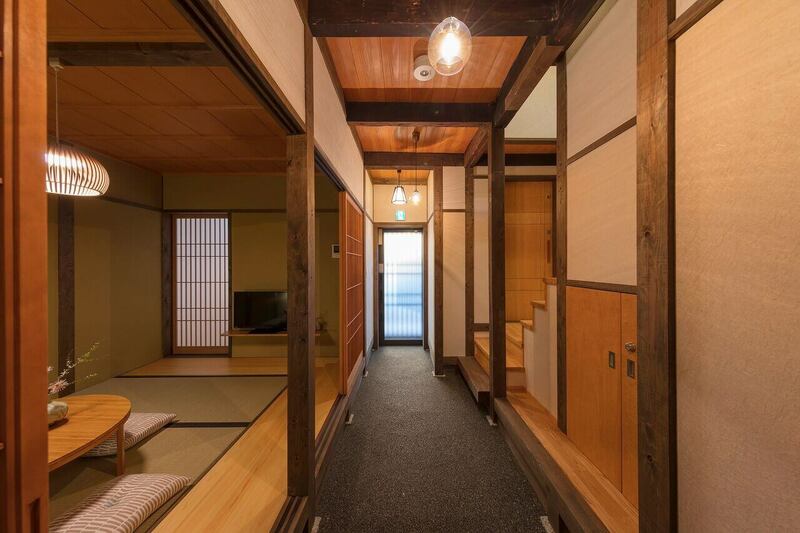 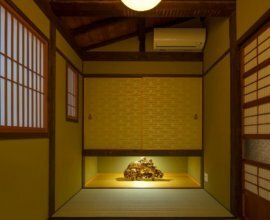 Elegant Japanese room Walk up the stairs and discover a striking art piece under golden sliding doors. 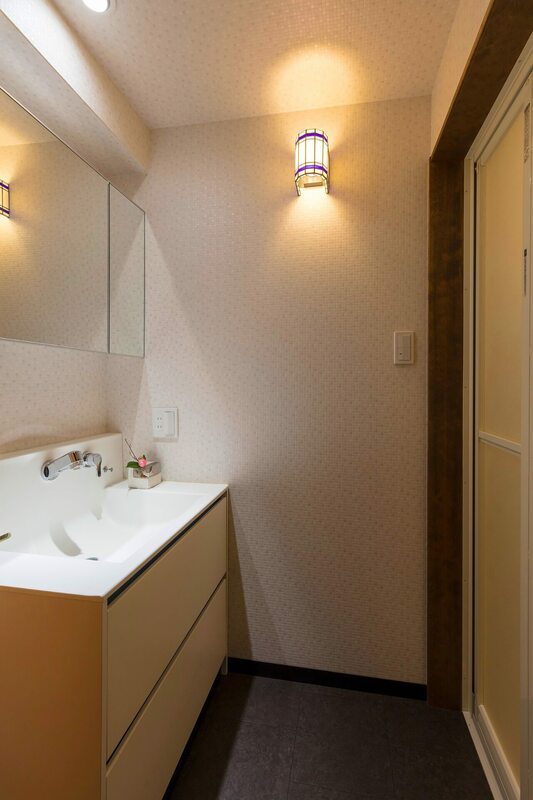 Catch a glimpse of the detailed design elements here, such as the finger catches in the shape of a gourd. 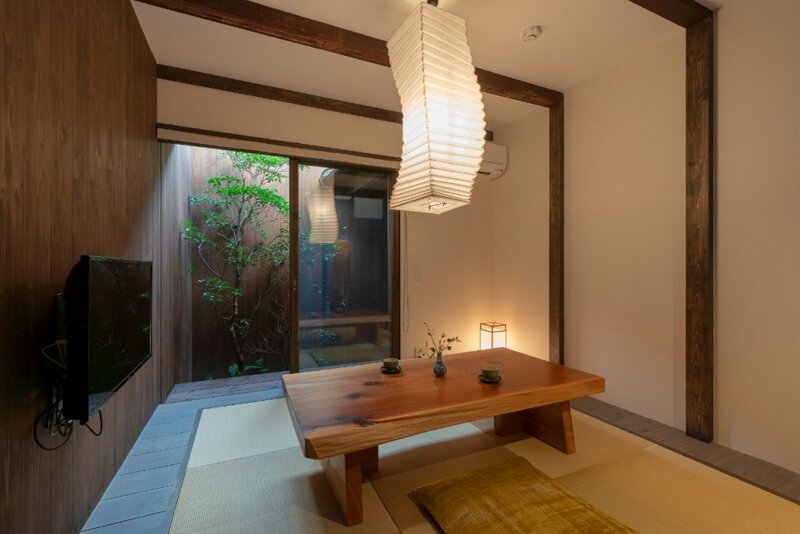 Living room Feel refreshed in this lively space. 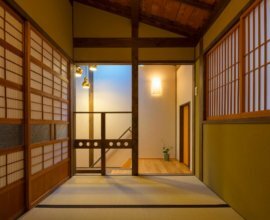 Along with the playful contrast between the orange woodwork and green walls, enjoy the shoji doors that showcase the garden. 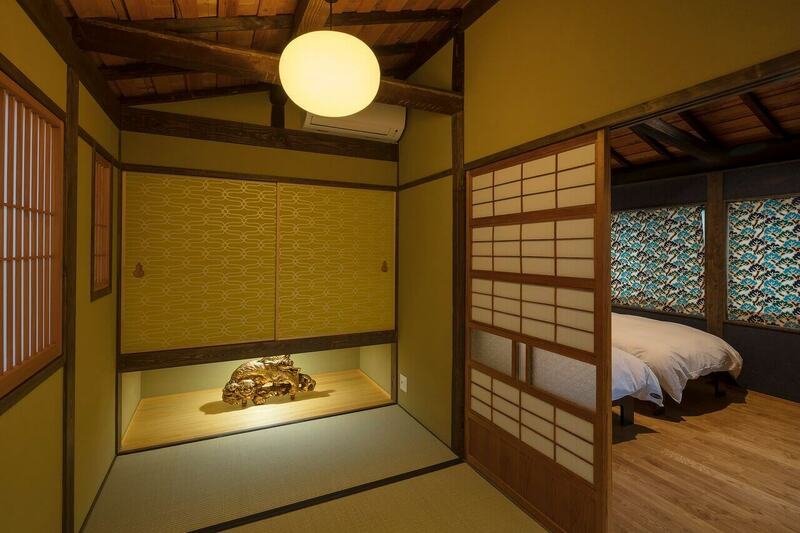 Western-style bedroom Follow the symbols of luck into the bedroom. 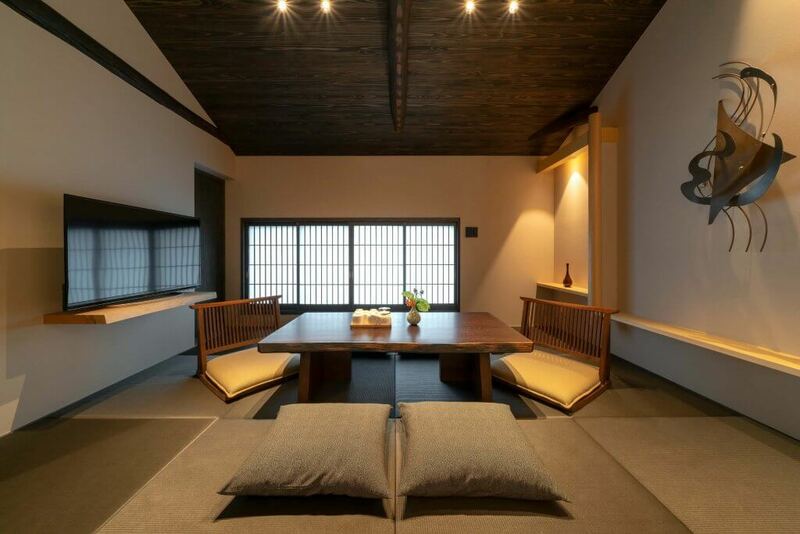 Retreat in this dramatic, yet calming room with textured dark-blue walls, high ceilings with exposed wooden beams and lattice doors. 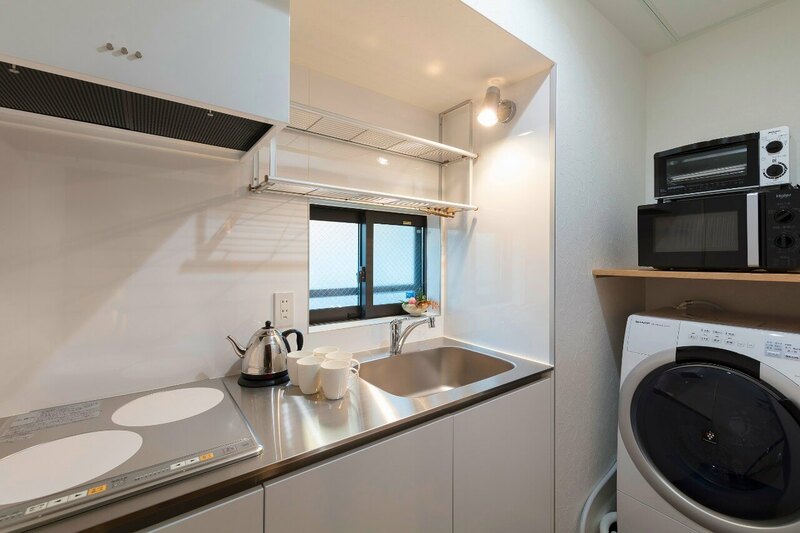 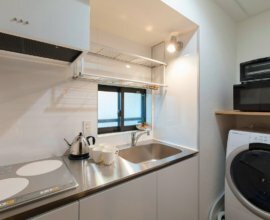 Kitchen Slide open the sliding door to reveal an all-white modern kitchen with a stove top, fridge, rice cooker, kettle, microwave and more. 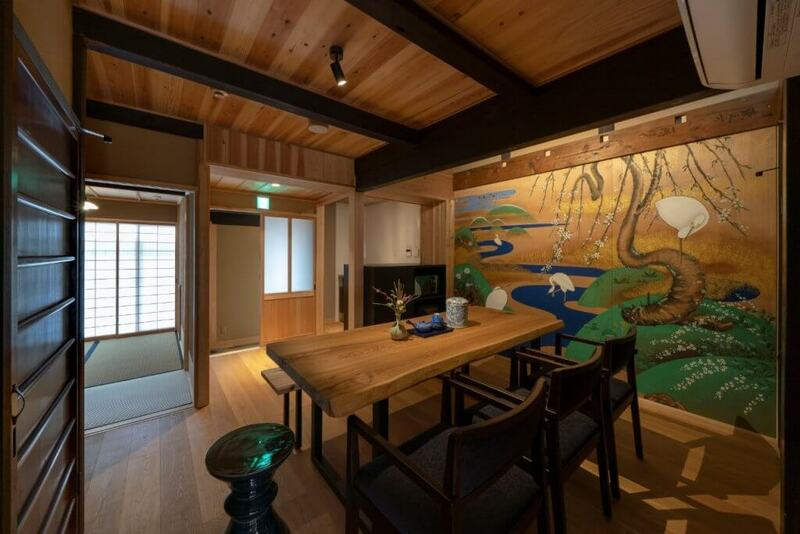 Just steps from the Shijo-Omiya Station with direct access to Arashiyama Bamboo Grove. 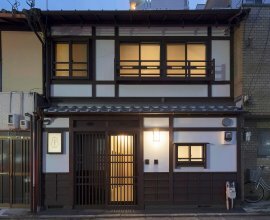 Just 3 minutes from the Shijo-Omiya district, enjoy access to public transportation that brings you to all of Kyoto's sightseeing spots. 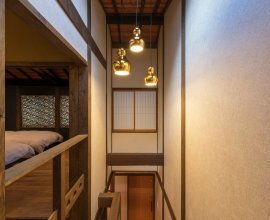 Buses will take you directly to the historical streets of Gion, the golden Kinkakuji Temple, Kyoto Station and more. 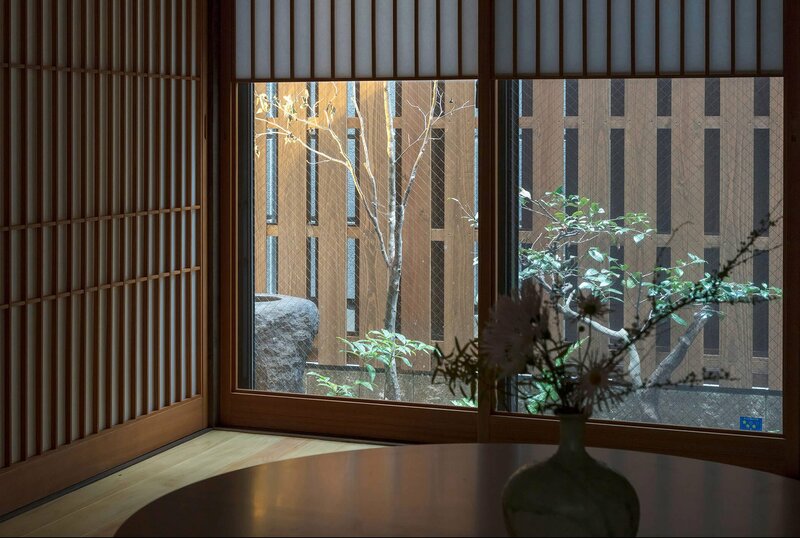 During the cherry blossom season, take the Randen Train Line and head towards Narutaki Station and view in awe what is known as the “Cherry Blossom Tunnel,” or visit the UNESCO designated rock gardens of Ryoanji Temple.